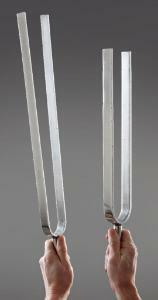 The large tines on these tuning forks create visible vibrations and emit sound waves at a lower frequency than traditional tuning forks. Set of two forks includes a larger fork with 50cm tines at 12Hz, and a smaller fork with 37cm tines at 38Hz. Set of two.